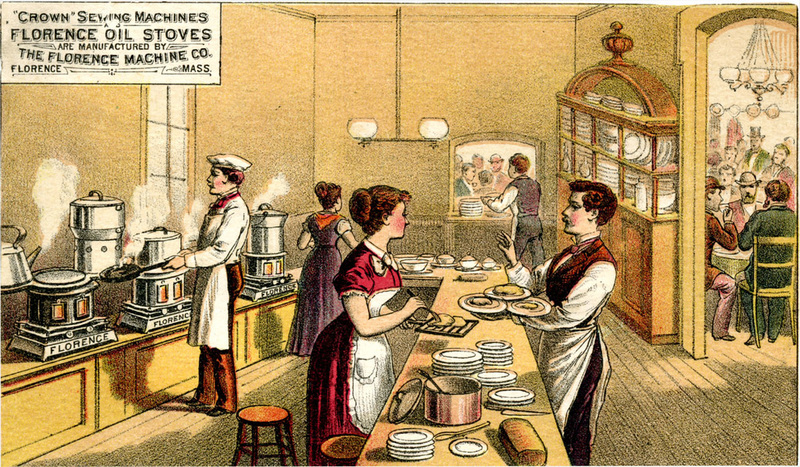 Foodways — how people produce and sell food and how people cook and eat it — is a popular topic. Everyone eats, and tastes and trends change. This new exhibition at Historic Northampton features nearly 250 years of Northampton's changing food scene. See a non-electric cake mixer, food choppers, and toasters. View vintage photographs of long-lived restaurants in Northampton. Compare food-related businesses on Main Street in Northampton from 1786, 1886, 1976 and 2016. All this, and more food tidbits about Northampton from the 18th century to the present. Vincenzo LoBello (front right in this picture) is shown with his business partners outside of their Boston Fruit Store at 241 Main Street, circa 1898. The store was so-named because LoBello travelled often to Boston to buy fruit. The market had a reputation for gourmet foods long before the idea was popular, and the sidewalk display was a familiar sight for sixty-two years before the store closed in 1960. 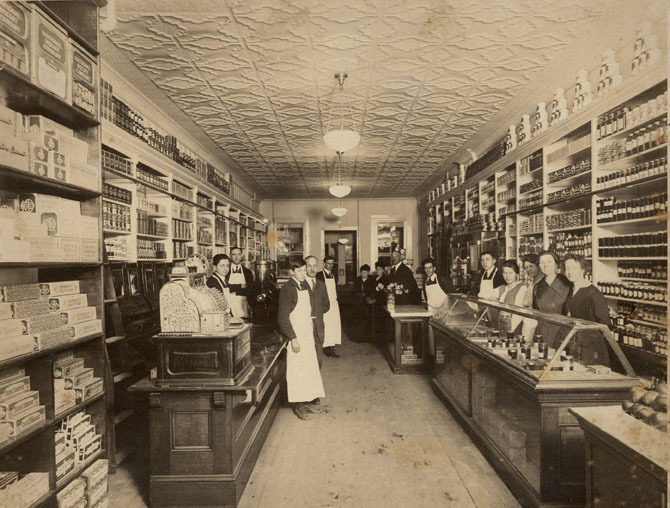 Up until the late 1940s, most people purchased food from small local stores such as the Central Grocery, located at 221 Main Street in Northampton. Helpful clerks would retrieve the items you asked for from the shelves, assemble your order, and even deliver it to your door. Supermarkets, where you serve yourself from aisles of shelves and pay at checkout counters, became the norm after World War II. On display are a sampling of clever kitchen gadgets and appliances from the 18th century through the 1950s. Shown at left is a Starrett vegetable and meat chopper, circa 1865. At right is a Landers, Frary and Clark universal cake-mixer. 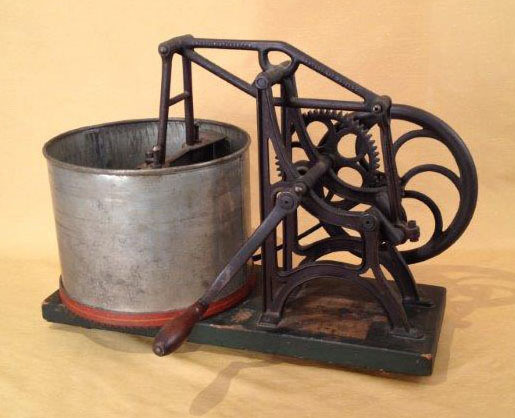 First patented in 1890, this cake-mixer is a later model with a 1905 patent date. Click on each image to view these non-electric kitchen devices in action (on the website Culinary Curiosity, The Mel and Janet Mickevic Collection at Kendall College). Very Local Food: Di﻿scover Gardening at the Shepherd House (66 Bridge Street), in 1916 and in 2015. This tomato box garden was planted and grown by The Bridge Street School Sprouts in 2015. In 2015, the Bridge Street School Sprouts grew vegetable box gardens on the grounds of the Shepherd House at 66 Bridge Street. The school received a grant to engage schoolchildren in growing their own vegetables and asked Historic Northampton for the use of its grounds. The Sprouts continue in the tradition of previous residents of the Shepherd House. The Shepherd family owned the property from 1856 to 1969. Letters written by Thomas Munroe Shepherd (1856-1923) in 1916 describe his activities in the garden. Thomas wrote to his wife Edith while she was visiting her family in California and included many references to the garden and its produce. 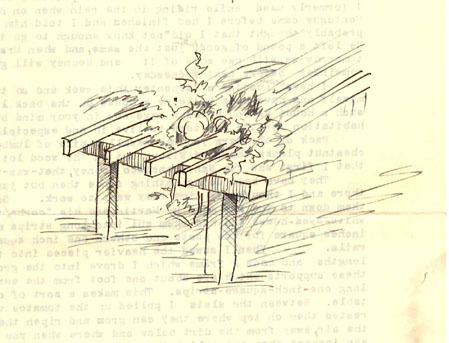 In one letter, Thomas recounts a habitation he built for growing tomatoes (see at right). Between the slats I pulled up the tomatoe vines and rested them on top where they can grow and ripen their fruit in the air, away from the dirt below and ... when you get home you can inspect them and select the ripe ones without bending over. Also on view is a large Plan of Main Street in Northampton, which highlights food-related businesses on Main Street in 1786, 1886, 1976, and today. The Plan reveals the shift from 18th-century inns to many late-19th-century makers and sellers of groceries, meats, bread, and even ice cream. The mid-1970s saw an influx of young entrepreneurs who fixed up neglected downtown buildings and founded businesses, some of which are still here, such as Broadside Bookshop and Fitzwilly’s Restaurant. Today there are many restaurants, including pizza parlors, Italian, Indian, Thai, Japanese, Chinese, and many other cuisines. In 2002, Hortense Clapp Pollard bequeathed to Historic Northampton the house at 70 Old South Street built by her father, Alvin W. Clapp. In her will, Mrs. Pollard directed that Historic Northampton sell the house with preservation restrictions to a buyer who would not alter even a doorknob of the house her father built. The house is currently owned and occupied by the design firm of Barron & Jacobs. Alvin W. Clapp, with his family, operated a meat market, Clapp & Clapp, located at 147-149 Main Street. Clapp & Clapp sold "fresh and salt meats, poultry, etc. ... and all kinds of vegetables." Among the contents of the Clapp Pollard house on display are photographs and billheads from Clapp & Clapp's meat market, as well as other food-related documents including the Clapp family's World War II ration books and a small sampling of cookbooks.